There are a lot of perks that come with membership at the New England Aquarium, like express admission all year and discounts at the Cafe and Gift Shop. Now you can add our new Member of the Week recognition to that list. How can members participate? Just show up and visit your Aquarium! We'll be randomly selecting members for this special honor throughout the fall. We’d like to introduce you to Julien and Reilly, our Members of the Week. We met them in the lower level of our West Wing at the Jellies exhibit. 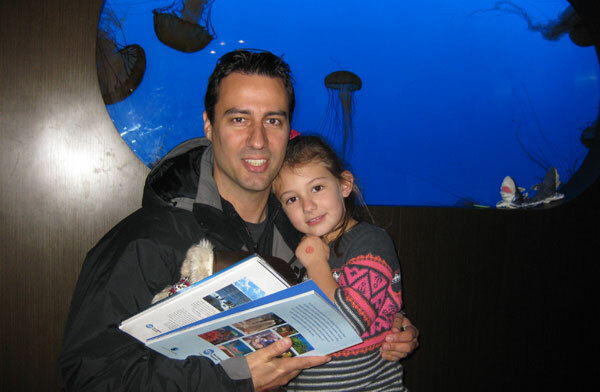 Their family recently came to our area from Atlanta, but they had visited the Aquarium before and, as Julien told us, they became New England Aquarium members right after they moved. For being our Members of the Week, Julien and Reilly received a free 4”x6” photo from our friends at SharpShooter; a copy of the beautifully illustrated Aquarium souvenir guidebook; a copy of Ice Island, by Dr. Greg Stone Ph.D., Aquarium Senior Vice President of Ocean Exploration and Conservation; and two plush sharks—one for Reilly and one for her to take home to Ryan.